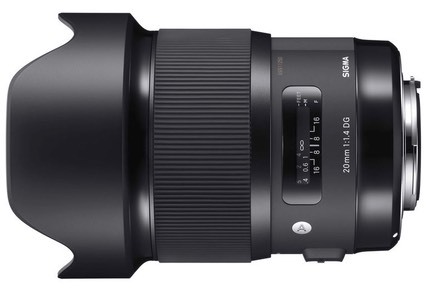 Sigma’s latest Art lens is the US$900 20mm f/1.4 HSM, announced today and shipping in December. Like all the recent Art lenses, it features Sigma’s USB Dock compatibility for firmware updates and focus tuning. At this point we have 20mm, 24mm, 35mm, and 50mm redesigns in the f/1.4 Art series. One might suspect that an 85mm in the new Art style might be next. We’ve had a lot of FX prime activity recently. Sigma has been redoing their primes. Zeiss not only redesigned their old ZF.2 lenses into the Milvus line while extending their high-end Otus line. Tamron entered the game with two slightly wider than normal primes. And, of course, Nikon has been cycling through a set of f/1.8 primes. What’s interesting is that in this round of prime-frenzy, Nikon is looking a bit staid and traditional. While there’s nothing at all wrong with the Nikkor f/1.8’s—as you’ll see when I post reviews of several of them next week—they seem “old school” and mostly new technology free. They really all should be E-type lenses with constant-size and position focus rings (for video use). Sigma has the USB dock compatibility and modern external design. Zeiss has new modern designs with de-clickable aperture rings (for video use). Tamron adds image stabilization. It truly seems as if Nikon’s lens designers are mostly just iterating optical designs, not rethinking how lenses fit into modern DSLR systems. The lack of video-friendly primes really stands out, for one. What I see in Nikon’s design teams is dysfunctional communication. The lenses aren’t being designed to the camera’s new features. Nikon hasn’t figured out how to update lens firmware, either: we’ve now had two new lenses that needed to go back to Nikon for firmware updates, while almost all the other players in the market have user-friendly ways of updating lenses. And don’t get me started talking about Nikon’s communications or software groups and how well they’re keeping up. What seems to be missing is one voice at the top directing every sub-group towards the same destination. Is Nikon in the video world or not? Are we going to get solid basic sets of enthusiast lenses for CX and DX or are those products simply never going to truly appeal to enthusiasts? Nikon’s lens lineup is the canary in the coal mine. What we see in lens rationalization from Nikon tells us whether their product lines are rationalized. At present, not so much. Good thing the third party lens providers are doing Nikon’s job for them.